Thomas Friedman wrote his best-selling book on a flat world in 2005. The caption below the title said "A Brief History of the Twenty-first Century." The book was a tour-de-force of the convergence of technology and communications, and the disappearance of physical borders. Given the instant fame and publicity that the book received, no one asked how one could write history looking forward. Just over a decade later, as we enter another year, the theory has come full circle. Today, more than ever before, we can say with certainty that the world is not flat, not just in the physical sense, but even as a metaphor. Of course, there were skeptics then as there are proponents today. Imagining that we live in a world where the factors of production have free mobility gives us a rare degree of comfort. Imagining otherwise can be worrying. Assume for a moment that the proposal to slash corporate taxes in the USA to 15% becomes a reality. That would make the USA the least taxed nation in the world by a long shot. Who would want to invest in other countries or resort to inversion as a strategy? And what if other countries, as a natural defense mechanism, also slash taxes? Or consider for a moment the avowed path to a growth trajectory of 3.5 - 4.0%. Indeed, throughout the period of the 1950s to the turn of the century, this was the average growth rate of the OECD countries. The growth had two components - moderate tax rates that contributed between 1.5% and 2.0% to growth, and a growing work force that contributed in equal measure. Today, the first component is possible with a drastic reduction in tax rates. Sadly, the second component is missing. We have reached the limits of what can be achieved through people. The changing demographics and the fact that the numbers available for employment just don't add up means that it is not possible to increase growth by more than 0.3% through the work force. So how does one reach the magical figure of 3.5 or 4.0%? Who cares for such details? Outsourcing and offshoring are on their way out. This was a flawed business model in the first place. It managed to create, by a strange mix of circumstances and chance, a few billionaires and many millionaires. It also very effectively amplified the inequities in social structures and the relentless pursuit of wealth as the only indicator of success. When 1% of the world's population owns over 50% of assets, do you still feel comfortable? The slowdown in the tech sector is visible. The growth of unicorns has clearly plateaued off. Major companies have been "re-valued" down. New rounds of funding can be had only with stringent conditions and many companies are simply pulling their shutters down. Don't take my word for it. Read the letter that the CEO of a major software company wrote to all employees on New Year's Day. One of the fundamental premises on which modern societies have been built is the notion that democracy represents the best opportunity for the full potential of a society to be reached. Yet, you will be surprised by the results of a massive survey conducted in 50 democracies. With the exception of Switzerland and the Scandinavian countries, the young people in the other democracies seem to suggest that powerful, authoritarian leaders are the answer to many of our problems. Not surprisingly, the older people still seem to consider democracy to be the best option. The rise of nationalism and protectionism is there for everyone to see. However, the fault lines are not where you would expect them. In fact, contrary to popular perception, the region that appears well prepared is Europe. Quietly, almost unobserved, Europe has brought its debt level as a percentage of GDP from 170% to 120% in less than a decade. Therefore, if there is one region that one can bet upon, it is Europe! Changing demographics, the slowdown in population growth and the consequent pressures on the work force, a significant reduction in migration, a noticeable fall in both foreign direct investment and foreign institutional investment all point to a gradual swing to mercantilism, protectionism, success as a zero-sum game, and the rise of leaders who are perceived to be decisive and powerful, and you have all the ingredients necessary for de-globalization. Add to this formidable cocktail a sting in the tail. Economists rarely agree on anything. There is general consensus though that too much debt can be problematic for any country. As a rule of thumb, a dollar of debt is supposed to lead to a dollar increase in GDP. This has held for most countries. At its peak of sustained double-digit growth, it held even for China. As the inevitable consequences of a centrally controlled economy started taking its toll, in the first decade of this century, China raised two dollars of debt to achieve a one dollar growth in GDP. Today, China's debt for each dollar of GDP is over four dollars. 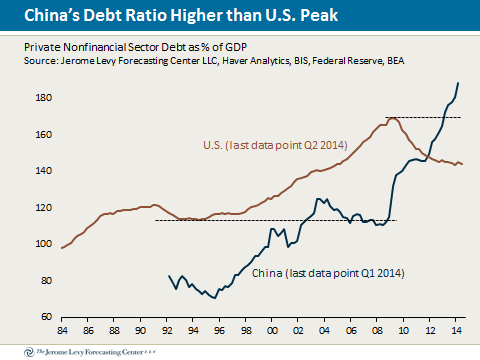 With an economy that is less than half that of the US, China has more debt than the US. The question is not if, but only when this bubble is going to burst. The resultant tremors across the world will render the recession of 2007-08 look like a walk in the park. Still think it is a flat world? Alternative constructs are most welcome.